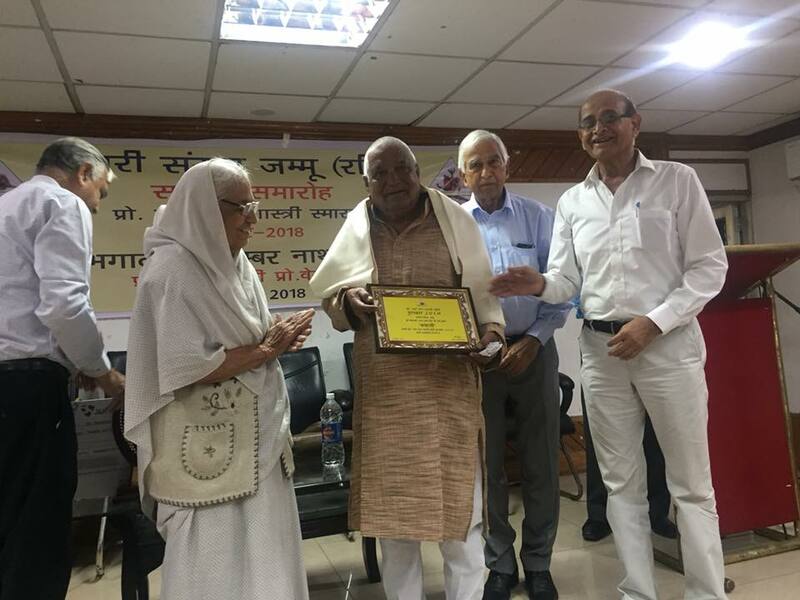 Prof. Ram Nath ShastriMemorial Award for the year 2018 has been conferred on Pitamber Nath Sharma forhis Dogri novel “Bhagaali”. 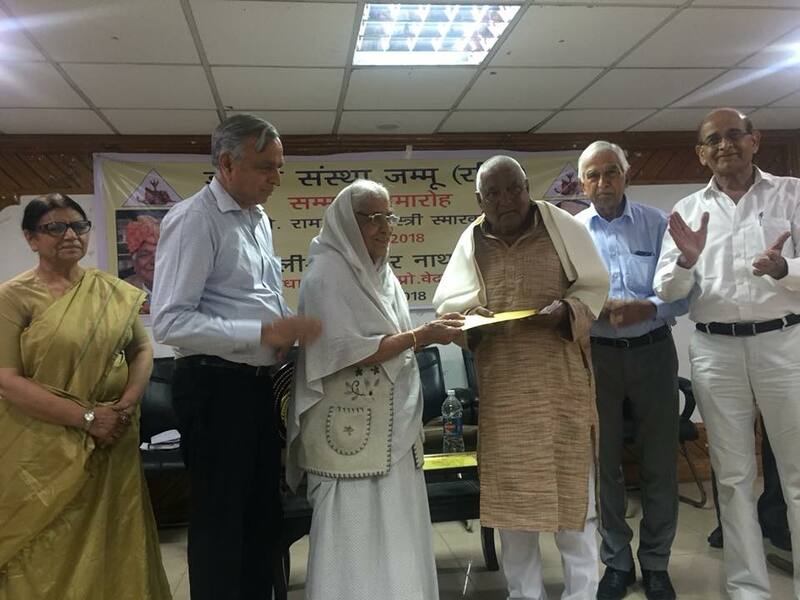 This prestigious annual award is given for thefirst book of a writer in Dogri in last five years. 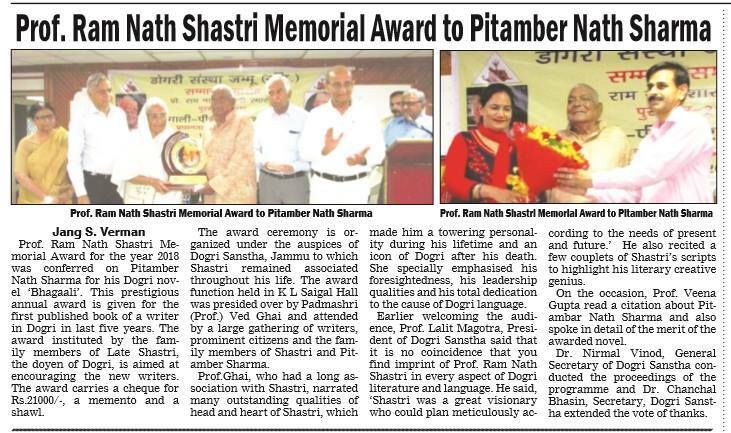 The award instituted by thefamily members of Late Shastri, the doyen of Dogri, is aimed at encouraging thenew writers. 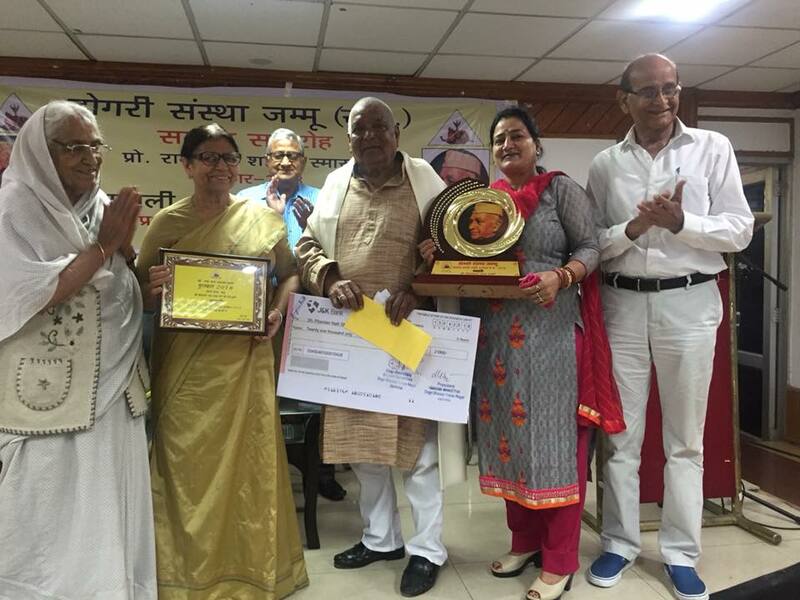 The award carries a cheque for Rs.21000/-, a memento and a shawl. 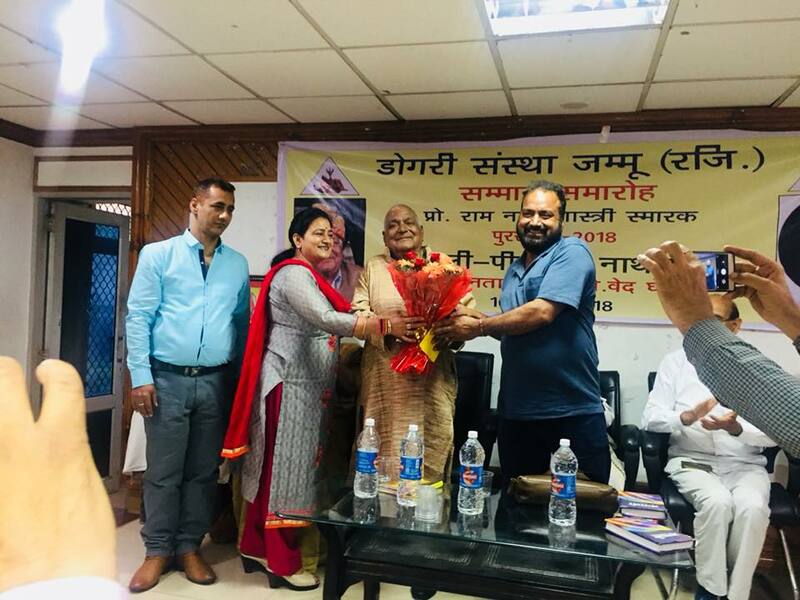 The award ceremony isorganized under the auspices of Dogri Sanstha, to which Shastri remainedassociated through out his life. 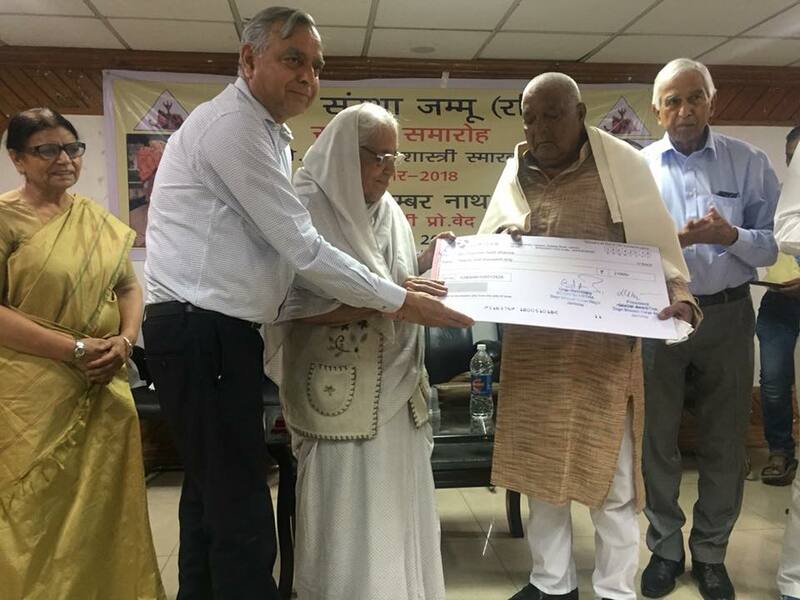 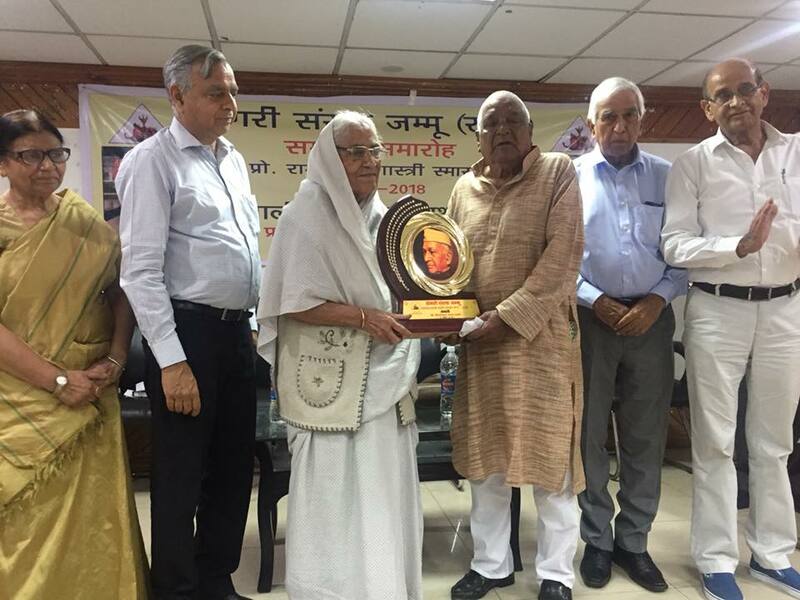 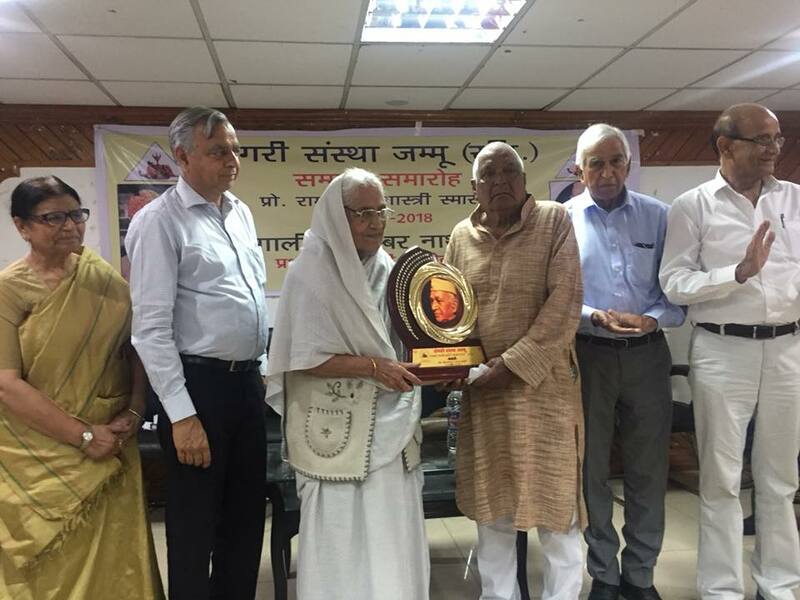 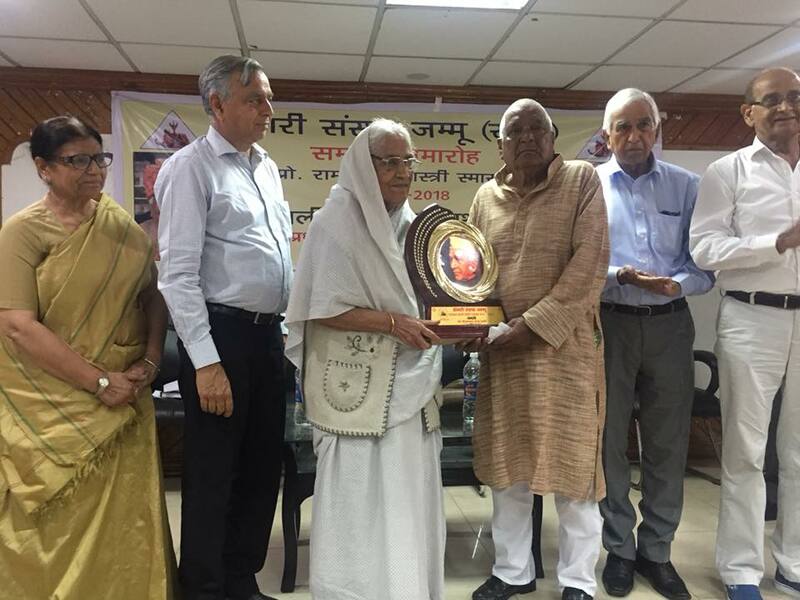 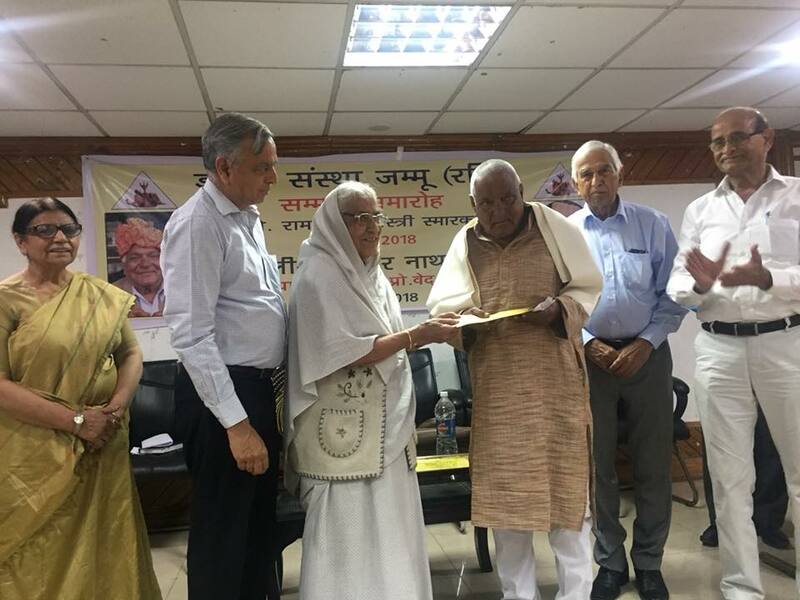 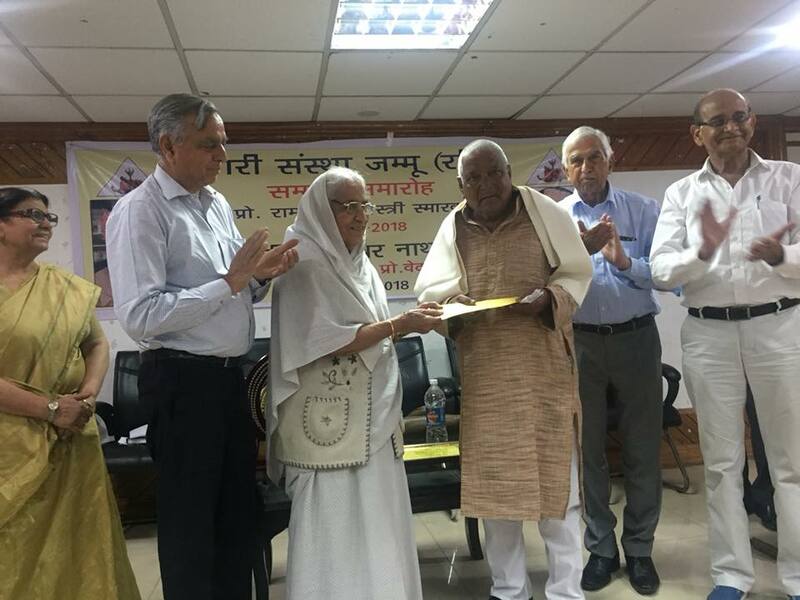 The award function which was held in K.L.Sehgal Hall was presided over by Padma Shri Prof. Ved Ghai and attended by alarge gathering of writers, the family members of Shastri and Pitamber Sharmaand prominent citizens. 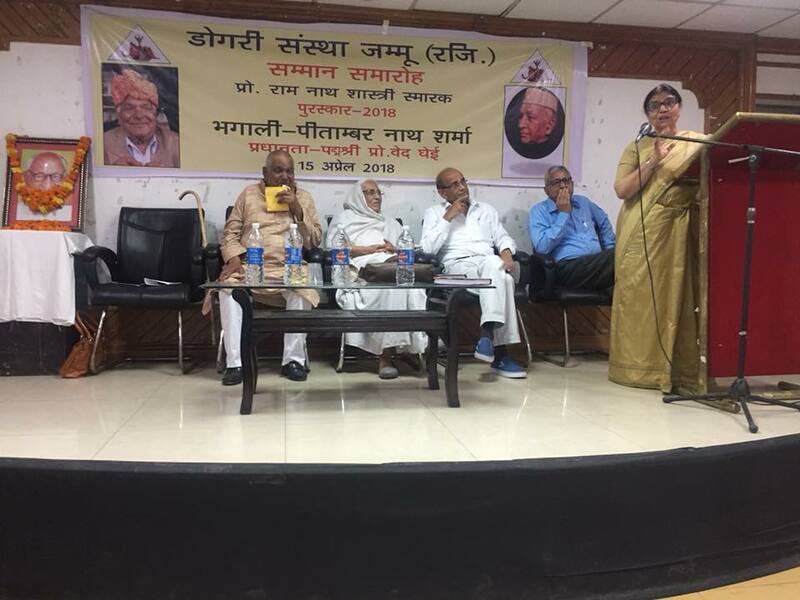 Prof. Ghai, who had a longassociation with Shastri, narrated many outstanding qualities of head and heartof Shastri, which made him a towering personality during his lifetime and anicon of Dogri after his death. 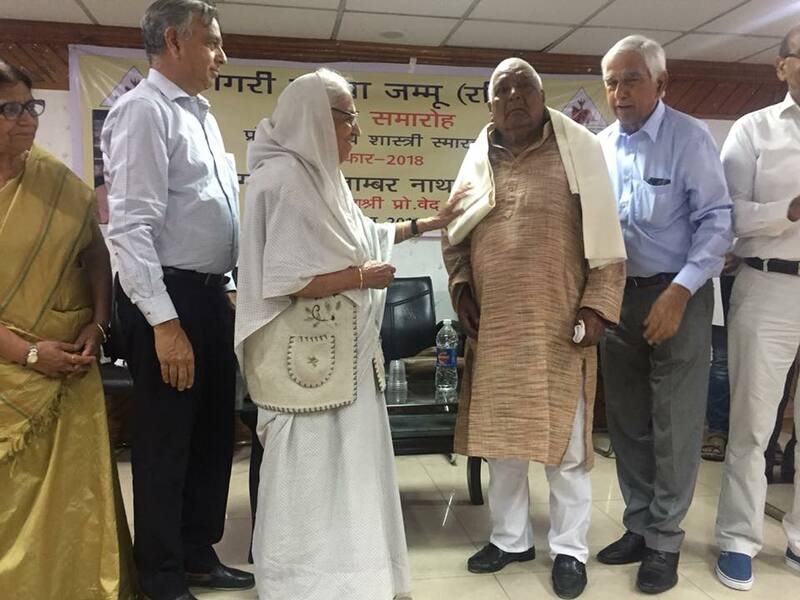 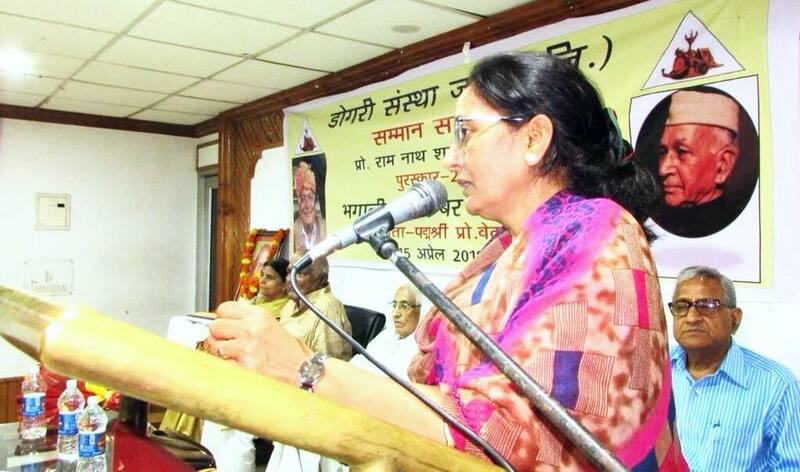 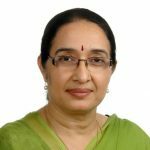 She specially emphasised his foresightedness,his leadership qualities and his total dedication to the cause of Dogri. 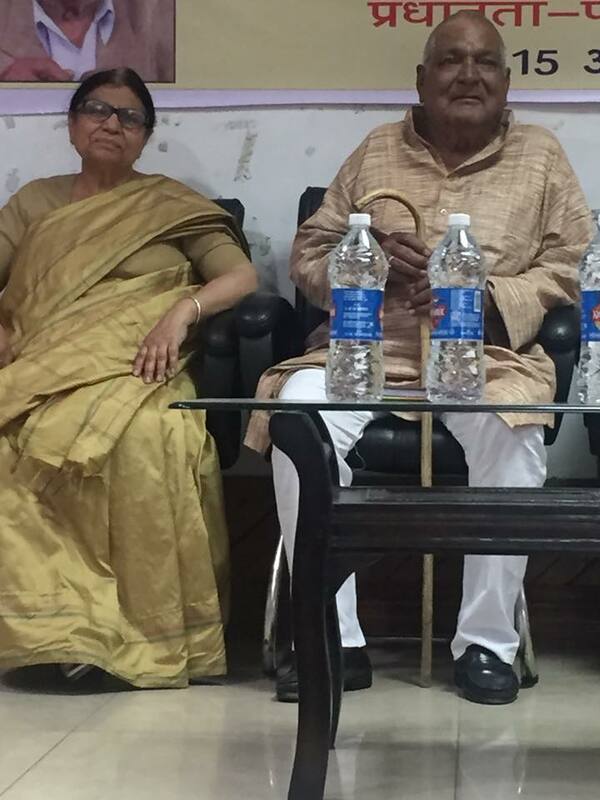 Earlier welcoming theaudience, Prof. Lalit Magotra, President of Dogri Sanstha, said that it is nocoincidence that you find imprint of Prof. Ram Nath Shastri in every aspect ofDogri literature and language. 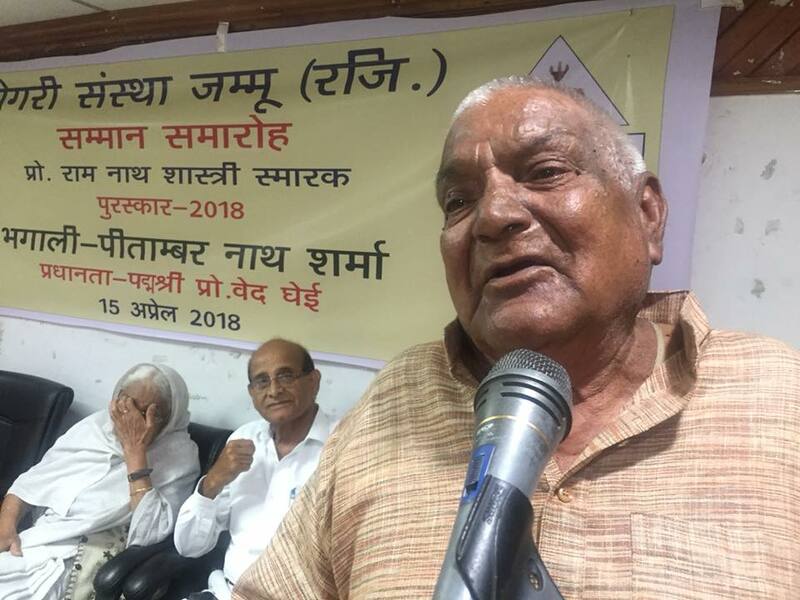 He said, “Shastri was a great visionary whocould plan meticulously according to the needs of present and future.” He alsorecited a few couplets of Shastri to highlight his literary creative genius. 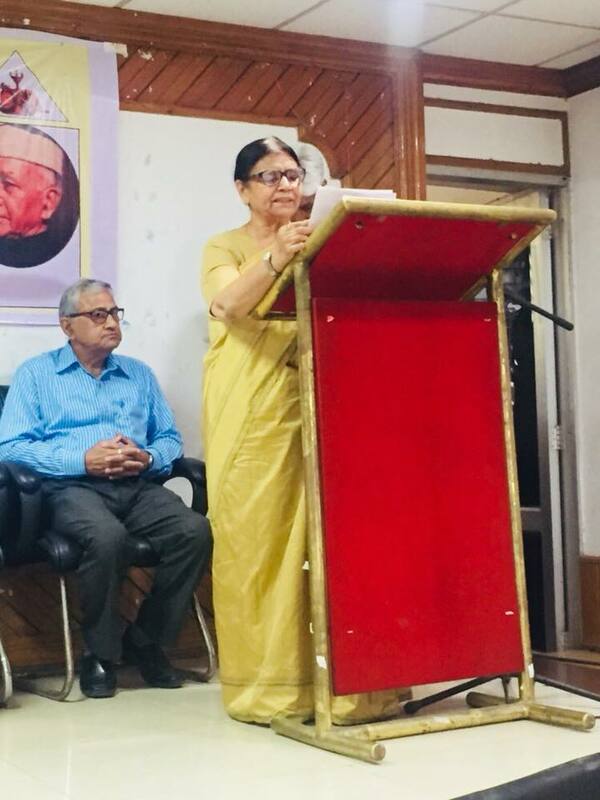 On the occasion, Prof. VeenaGupta read a citation about Pitambar Nath Sharma and also spoke in detail ofthe merit of the awarded novel. 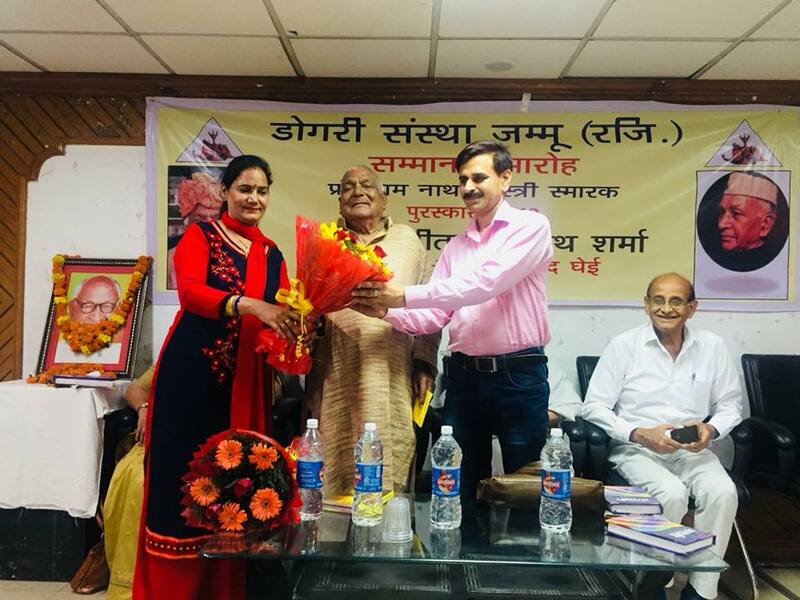 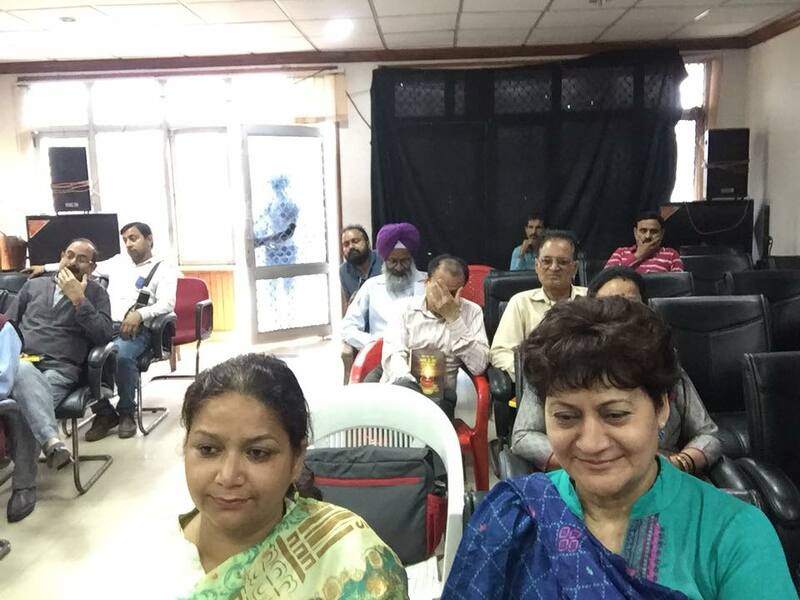 Dr. Nirmal Vinod, GeneralSecretary of Dogri Sanstha conducted the programme and Dr. Chanchal Bhasin,Secretary of Dogri Sanstha presented the vote of thanks.